Political communication is an area that has evolved considerably in recent years. However, it is a framework in which many of the strategies that have occurred mainly with the appearance of charismatic figures such as John F. Kennedy have been recycled. Since then, in terms of political marketing, certain strategies and trends have been taken as examples that have marked the trajectory of many political profiles. We have paid special attention to this issue since the appearance of the first televised debates in which it was proved that there are elements that go beyond the words or speeches read. In terms of political communication, everything counts. It is essential to understand that the trends followed by users and audiences are essential when defining needs in terms of content creation. The changes to which political communication adapts are due to external factors, mainly linked to the different trends in media, now and for years, marked by the presence of new technologies. We have seen from campaigns in which the discourse has been transferred to other celebrities (singers, actors, writers ...), different formats of debate, interviews, documentaries, to the most current in which the scenario has changed completely, everything is more instantaneous. Today, all the political content is just a click away. It is important that we understand the development that has followed the political speech. As new methods of persuasion have emerged, they have been incorporated into the various strategies that form part of political communication. The current political speech focuses on strategies focused on a way of communicating that is close and spontaneous. This is where the new media, such as social networks, play a fundamental role. Today, there is no electoral speech that does not have a presence in all the channels. One of the keys we find with social networks, specifically in Instagram, is the simplification of the message. This makes simplicity one of the aspects most valued in terms of the image of the politician, something that has to be aligned with the discourse that follows, so that there is coherence between words and action. The future of political speech has as a protagonist the record button, combined with live streaming, the Stories format and everything it brings with it: poll stickers, gifs, hashtags, Q&A, filters, and much more. 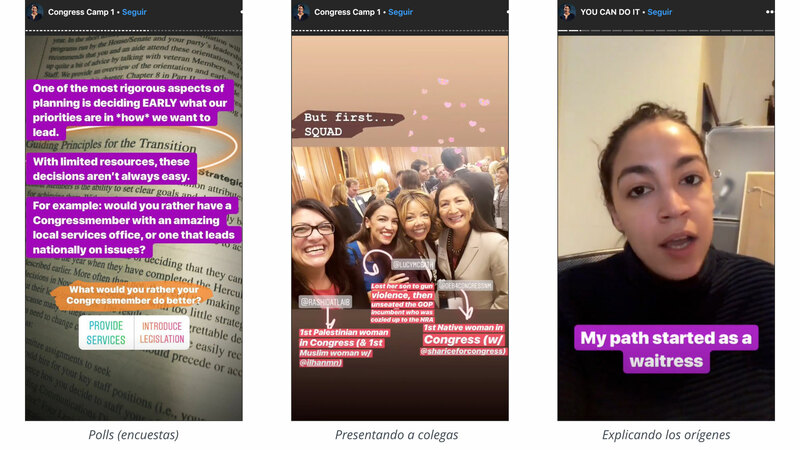 Instagram Stories is the network that has had the most prominence in recent months, as it concentrates two of the most important factors when it comes to profiling the image of a politician: immediacy and spontaneity. This makes it possible to structure the different messages according to the needs of the users, as the feedback is much more instantaneous. Today, one of the best examples can be found with Alexandria Ocasio-Cortez, a Democratic Party congresswoman in the United States. This profile concentrates the different keys when communicating through Instagram Stories in the political context. We can see from more formal content in which it explains different types of concepts in a natural and simple way, combining it with the different functionalities offered by IG Stories, such as, in this case, polls. This provides an important factor in this new model of political discourse that is the interaction with the audience. Also part of the communication strategies is the fact of showing something that goes beyond, as is the human factor, through photos or videos with colleagues, or explaining the story behind that has taken the person to the point where he is now, which fits perfectly with the empathy generated according to which profiles thanks to formats such as IG Stories. What's the impact of this new way of communicating? These "de-facto rallies" carrying out a good management of the presence in Stories has a direct positive impact on the political image. It is essential to understand that the image projected by the politician through this type of action must have empathy with the public as its central focus, since people like to feel identified with the content they consume. It is important to bear in mind that the new communication models do not change the way politicians speak, but the way voters evaluate political discourse and, therefore, the different qualities of politicians.